This reading and listening exercise is based on a song by the Spanish national football team. It is suitable for level A2 Spanish students and contains some B1 grammar points. Yes it's that time of year again, it's the FIFA World Cup! Whether you are an avid football/soccer fan, just follow the major national games when they come round, or like to pretend you have no idea what those people are doing running around after a ball, for all Spanish-speaking countries football is something of an obsession. Spain is no exception and their national team is affectionately known as La Roja, a reference to the colour of their shirt. 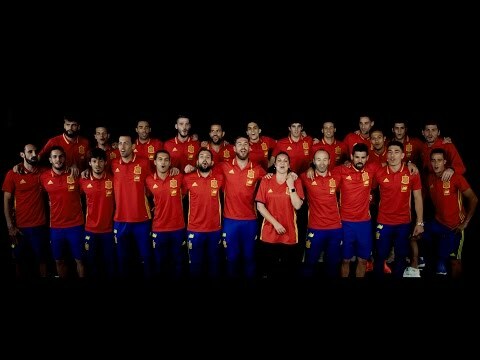 The song in the video below was recorded by the Spanish national team in 2016 for the Euro competition. The main singers are Sergio Ramos (one of Spain's best defenders and captain of the 2016 Euro team and also captain of his club, Real Madrid) and Niña Pastori, who from a very early age has been a successful Flamenco singer. How did you find this exercise? Will you be watching the World Cup this year? Leave a comment below!